The sweat of a Blue Raider lubricates the gears of excellence. A Blue Raider perseveres against the odds, against the grain. When margins are thin, a Blue Raider grinds for the extra inch. Head Coach Rick Stockstill and his staff have worked tirelessly to bring in the next great class of Blue Raider recruits. Stockstill's 12th signing class will begin to be unveiled with the initial early signing day on Dec. 20. Keep up with all the news and watch the NLI's roll in right here on GoBlueRaiders.com. Updates to GoBlueRaiders.com Signing Day Central will begin at 7 AM. Here you can read signee bios once NLIs are validated by our compliance officers. Also, follow @MT_FB on Twitter for all the up to the minute information. Stock: "Has great size, athletic, and knows how to finish. A true tackle"
Director of Player Personnel Will Redmond on Bragg: "Dawson is the true definition of an offensive tackle. He's long, athletic, and finishes his blocks. We knew from the moment we met Dawson he would be a great fit in our offensive line room and with our coaching staff. We wanted to add a bookend to this class of offensive lineman, and Dawson provides us that." Stock: "His athleticism and size jump out immediately"
Director of Player Personnel Will Redmond on Branch: "Jorden is a multi-positional player for Crockett County High School in Alamo, Tennessee. Whether you're watching tape of him playing running back or defensive tackle, his size and athleticism immediately jump out at you. We are excited to add Jordan's skills to our defensive interior." Stock: "A speedy naturai hitter who runs smooth and can play multiple positions"
Director of Player Personnel Will Redmond on Campbell: "Coach Shafer and our defensive staff were excited when they turned on Jarek's tape and saw his speed. Jarek is a natural hitter, smooth runner and has played multiple positions throughout his time at Riverdale High School here in Murfreesboro. Jarek is a great fit for what we do defensively at linebacker and we are excited to welcome him and his family to ours." Stock: "A big-body target who brings a wealth of collegiate experience"
Director of Player Personnel Will Redmond on Casey: "Gatlin will bring plenty of college football playing experience to our wide receiver room. As a productive outside receiver at Lehigh University, our hope is Gatlin will provide a new big-body target for our offense. We are excited to add him to this year's signing class as a graduate transfer." Stock: "Intelligent and has great awareness and strength"
Director of Player Personnel Will Redmond on Falvey: "Tyler is as equally smart on the football field as he is in the classroom. His awareness and strength are two factors that drew us to him immediately. Tyler's size is a great upside as well. 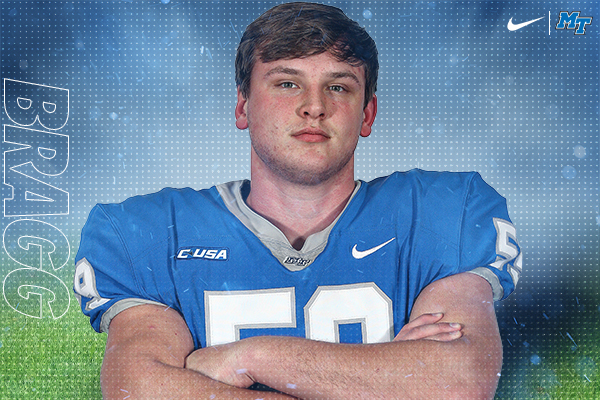 We are excited to add Tyler to the Blue Raiders." Stock: "Hard worker who loves contact"
Director of Player Personnel Will Redmond on Gilchrist: "Will is one of those players that loves contact. He's constantly searching for the next block and works hard getting to the second level of defenders. Recruiting Will was fun because he was high school teammates with fellow signee, Matt Martin. Stock: "Hard hitter, effective against run and pass"
Director of Player Personnel Will Redmond on Gladney: "Kendricks joins us from ASA College in New York City. Kendricks is a hard worker and a hard hitter. In both run fits and pass coverage, Kendricks will have an opportunity to make an impact with our team next season. We look forward to seeing him in Middle Tennessee Blue." Stock: "A very versatile player in the secondary who played offense, defense and special teams in high school"
Director of Player Personnel Will Redmond on Grate: "Greg joins us from Miami Florida's Carol City Senior High School. Greg was a three-way player helping his team on offense, defense and special teams. Greg can play safety and cornerback, and his versatility in the defensive secondary immediately stuck out to Coach Shafer and our defensive staff." Full name: Gregory Grate Jr.
Stock: "Toughness is what this talented player is all about"
Director of Player Personnel Will Redmond on Greer: "Everyone we spoke to about Marcus could not say enough about how tough he was. Whether our staff was on the road at summer camps, in high schools, talking with area coaches - everyone said the same thing... Marcus is tough. Needless to say, we wanted that toughness here in Murfreesboro." Stock: "A sharp kid who will bring leadership and experience"
Director of Player Personnel Will Redmond on Hudson: "Cordell comes to us from Syracuse University as a graduate transfer student-athlete. Cordell is a natural fit for our defense schematically at the corner position, having started his collegiate career with Coach Shafer. Cordell is a sharp kid, and will bring new leadership and experience to our defensive secondary." Stock: "JUCO All-American with a tremendous upside"
Director of Player Personnel Will Redmond on Jackson: "It's hard not to like Devon Jackson when you meet him. Devon is a highly productive player and competes for every ball thrown his way. Devon's work after the catch is also very impressive. We are excited for him to make the trip from his hometown of Renton, Washington to Middle Tennessee." Full name: Devon Jackson Jr.
Stock: "Very athletic and always around the football"
Director of Player Personnel Will Redmond on Jones: "Avery is an exciting linebacker to watch. He�s constantly around the football as a middle-backer. At one point in his career, Avery played on the defensive line, and we loved the idea of taking an athletic middle linebacker with some DL experience." Stock: "A finisher who is very consistent in his play"
Director of Player Personnel Will Redmond on Martin: "The moment you turn on Matt's film you notice the consistency with which he finishes blocks. Doesn't matter if he's blocking on the line, or out in the flat, Matt is going to put everything into his finish. Adding that mentality was a priority for us with this signing class, and Matt will provide that." Stock: "A competitor who is smart and driven"
Director of Player Personnel Will Redmond on Nolan: "Chance is a great quarterback and competitor. His football intelligence and driven personality make him a great fit for what Coach Stockstill and Coach Franklin want in their quarterbacks. Chance is a record setter in high school and we hope to see that same productivity here at Middle Tennessee." Stock: "Has tremendous speed, a quick twitch and excellent ball skills"
Director of Player Personnel Will Redmond on Ross: "The first thing you notice when you turn on Teldrick's film is his speed. Teldrick was the starting quarterback at Jones County High School in Macon, Georgia and was a dual threat in every aspect. His quick twitch and ball-skills made him the perfect candidate to join our defensive secondary as a cornerback." Stock: "A tough, hard-nosed lineman with a bright future"
Director of Player Personnel Will Redmond on Ryles: "Jahlil continues the theme of tough-nosed offensive lineman. He was an Alabama vs. Mississippi All-Star selection and his work this season proved that. Jahlil has seen lots of success on and off the football field and we are excited he will be joining us here in Murfreesboro." Stock: "A very athletic player who shined at our camps"
Director of Player Personnel Will Redmond on Shiflett: "Luke is a fantastic quarterback and athlete from the Dalton, Georgia area. Luke is a 3-sport letterman and his athleticism really shows when you turn on his tape. We witnessed his ability at our summer camps over the years and knew he would be a player for us to keep an eye on." Stock: "A great athlete with SEC experience"
Director of Player Personnel Will Redmond on Stamps: "Chris is a great football player and young man. He has SEC experience, which will be nice to add in our secondary, and was a target early in the recruiting process for us. Coupled with his leadership skills and athletic ability, Chris has the makeup to be a special player at MT." Stock: "Has great size for a defensive end and was also a gifted basketball player"
Director of Player Personnel Will Redmond on Starling: "The first thing you notice when you see Jorden is his size. At 6'6, 235 it's hard not to be excited about adding his frame to our defensive end unit. Jorden is not only a great football player, but a gifted basketball player as well, and had opportunities to play both at the next level." No offense is too fast or too devious for this modern offensive savant. His 2016 and 2017 units have combined to set numerous career and single-season records, while also producing a number of individual record setters. Conference USA's longest tenured head coach and the sixth longest in the nation. Stockstill guides players through to graduation with high standards both on and off the field. Bowl eligible nine times in 12 years. Shafer brings a wealth of defensive experience to the Blue Raider family. He vows to put a physical, attacking, multiple defense on the field that will excel in fundamentals and tackling. Shafer’s 2017 unit was one of the most improved in the country. Strength is built through unity, the forging of bonds in support of a common purpose. The game of football brings us together. Sportsmanship and the pursuit of excellence is the promise made one to another. There are no disguises here. Football is family at Middle Tennessee. We're molding the citizens, fathers and leaders of the future. We must support one another, hold each other accountable and be the example we want others to follow. Coach Stockstill hasn't forgotten: the role of student comes before that of athlete and the legacy we leave behind is the most sacred of concerns. Interested in season ticket information or donor opportunities? Unite with the 2018 signees as they commit to Blue Raider football! Become a member of the Blue Raider Athletic Association and qualify for special seating, hospitality benefits, parking, away game privileges and much more. See you in Floyd this September and Go Blue Raiders!